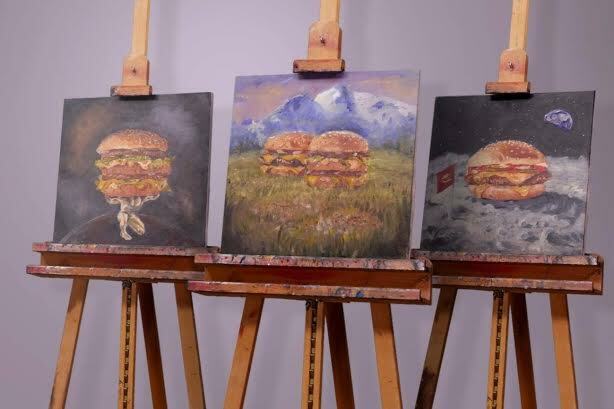 The fast-food chain, long worried about negative commenters, decided to roll the dice on a Bob Ross-style video last week incorporating questions from consumers. Here's what it learned. When McDonald’s hosted its first Facebook Live video in honor of National Hamburger Day last Wednesday, more than 80% of the feedback was positive or neutral. This came as a surprise to the fast-food giant, which had avoided using live-streaming video platforms to engage consumers out of fear of criticism. McDonald’s hour-long Facebook Live broadcast was in the vein of a Bob Ross-style art show, hosted by an improv comedian playing the character of "Bevin Burger." He appeared to paint three burger-inspired works - "The Beefy Gastronaut," "Burger Brawn," and "Beefy Peaks." The paintings were actually created by artist Adam Holzrichter. "Of course McDonald’s is certainly not immune to being talked about; we see the full spectrum of what that can be," said Paul Matson, McDonald's director of U.S. social engagement. "Going towards doing something like this live activation, if we were having this conversation a year ago, I wouldn’t have told you that McDonald’s was in a good enough place where we were willing to try something like that." Matson explained that part of what makes a live-streamed video interesting to watch is the fact that anything can happen. And because a live video draws so much attention, it can also open a brand up to all kinds of commentary – good and bad. McDonald’s has a Periscope account, but has never used it. Still, the company has more than 60,000 followers on the platform. Matson said McDonald’s finally decided to test the waters of live video with Facebook Live due to the massive amount of interest in it, with brands such as Kohl’s and senior executives using it as an engagement tool. As far as social media platforms go, McDonald’s largest audience in the U.S. - more than 64 million followers – is on Facebook. Another reason behind the timing of McDonald’s Facebook Live debut? National Hamburger Day, which Matson called a "religious holiday" for the brand. About two months ago, McDonald’s marketing team, with the aid of creative agency Leo Burnett, began to brainstorm for the Facebook Live activation. No external PR firms assisted. McDonald’s wanted to focus the Facebook Live event on the chain’s iconic Big Mac and Quarter Pounder with Cheese menu items and to communicate that the burgers are made with 100% real beef and have no preservatives. But Matson did not want consumers to feel that they were being "sold to" during the Facebook Live event. He wanted people to be naturally drawn to it, rather than inserting the brand into consumers’ lives through paid advertising. "We wanted people to understand that we take our food and our people seriously, we don’t take ourselves too seriously," said Matson. "We want people to know there are humans [behind the brand] and we love our brand and we love to have fun. We are not in selling mode 24/7 and even more so this was another way for us to communicate the quality of our beef and the rest of our menu." During the Facebook Live event, Facebook users quickly caught on that Bevin Burger was a character, sending him questions during the broadcast. "Bevin had an earpiece on during the broadcast and we had a team that would look at all the comments and send some of the audience’s questions to him for him to incorporate into his improv," said Matson. The video garnered more than 2,000 comments during its stream. McDonald’s is considering using the Bevin Burger character again in future marketing efforts, Matson added. Matson and his team aimed to get an audience of 60,000 people, but the video ended up reaching more than 1.1 million Facebook users, and 64,000 people engaged with it. Additionally, 31,000 minutes - or 520 hours – were consumed within the video’s first 24 hours online. "This experience was an indication that people are willing to sit and watch more than a 15-second TV commercial," said Matson. "They will sit and watch a video for three or four minutes at a time, which was unprecedented for most brands that try to activate in that space." Most of McDonald’s Facebook audience consumed the video on a mobile device, he added. Yet because the video was live, it could not include subtitles. This was risky because most people watch videos on mobile devices with the audio turned off. "People don’t want to be disrupted [with content from brands] unless it is inherently interesting to them," said Matson. "People being pulled into our experience and then turning the audio on was another interesting facet for us." The video’s results have inspired McDonald’s to experiment with more activations on Facebook Live and other live-streaming platforms such as Periscope, Matson said. "Doing something like this in a context where we had zero advertising and no paid dollars used to support this, it earned its own legs," he said. "We think that paves the way for what we call a pull strategy: creating things and experiences across social and digital that naturally pull people in."